Motorola today announced the Moto E4 and Moto E4 Plus, two low-cost Android smartphones that sit one step up from the entry-level Moto C handsets. Both the E4 and E4 Plus run Android 7.1 Nougat and include Snapdragon 427 quad-core processors with 2 GB of RAM, and 16 GB of storage. Other shared features include wide support for 3G and 4G networks, Bluetooth 4.1, GPS, microUSB, 3.5mm headphone jacks, and front-mounted fingerprint readers. Moto E4: The Moto E4 features a metal design, 5-inch 720p HD screen, and 2,800mAh battery. It also boasts an 8-megapixel main camera with an f/2.2 aperture, LED flash, and autofocus, and a 5-megapixel front camera with selfie flash. 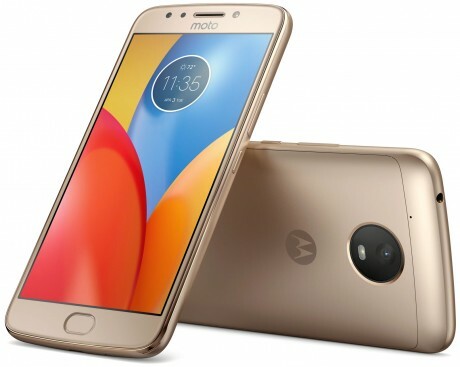 Moto E4 Plus: The Moto E4 Plus (pictured) relies on a metal design, too, but improves the screen size to 5.5 inches (still 720p HD) and the battery to a massive 5,000mAh. The phone ships with a 10W charger for rapid power-ups. The E4 Plus also packs a 13-megapixel main camera with f/2.0 aperture, LED flash, and autofocus, and a 5-megapixel front camera with selfie flash. Motorola says the E4 and E4 Plus will be available in a gray or gold starting later this month. The Moto E4 will cost $130 and the E4 Plus will cost $180.